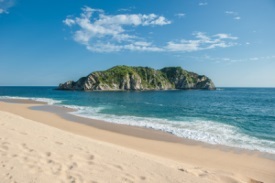 This resort area is near the village of Puerto Escondido. It has nine bays with beautiful beaches that are among the cleanest, safest and least crowded on the west coast, and big waves that are great for body surfing. Exceptional boat trips to isolated bays and beaches are available, and there are some facilities for deep-sea fishing. The snorkeling is also excellent.